My friend Vanessa invited me to Pampanga to see their newly opened bakeshop outside The Orchid Gardens, a popular resort in the area. Ian, a friend who I travel a lot with, came along. Matti’s Bakeshop started as a kiosk in a strip mall in Pampanga. It’s now a bakeshop and cafe. The first time I tried their cakes, I mentioned that they made the best carrot cake I’ve ever had, and I’m glad to say that, years later, this is still the case. Ian agreed. Too bad I have to go all the way to Paampanga to get it. Aside from the carrot cake, must-trys include the ensaymada, soft and even made more interesting by the addition of cream cheese; the spaghetti, Pinoy-style sweet and strangely unputdownable, the kind you have too keep eating (Ian had leftovers for breakfast and said it tasted good even when cold–Ian may be a big guy, but he reserves his calories for food that’s worth eating); and the fruit tea, green tea steeped with different fruit, warm and sweet and comforting. Pampanga is famous for its cuisine. It’s the kind of place where even a random street stall will yield delicious fare. But it isn’t just the food. There are historical places to visit as well. The San Fernando Railway Station, a small, rectangular brick building that used to house the now defunct train station is now a museum filled with relics that date back to World War II, when it was used as the last stop in the Bataan Death March. Not part of the exhibit but equally attention-grabbing is Marsing, the station’s adorable pit bull. Mars, as she’s called, the station manager adopted Mars, as she’s fondly called, because she would have been put down otherwise. She’s affectionate and loves attention, so be sure to say hello. There are ancestral houses nearby thaat aren’t open to the public yet, though there are plans to do that soon. There’s also the San Guillermo Church in Bacolor, which was mostly buried under lahar after Mt. Pinatubo erupted in 1991. The church is fully functional though it remains half-buried–it only takes a short staircase to get to the belfry, where bats still live. Time and stomach constraints meant that we could only try a few restaurants. Since Ian and I had already tried Aling Lucing’s, where sisig was supposed to be invented, we decided on Mila’s Tokwa’t Baboy and Sisig, Lucing’s closest rival. 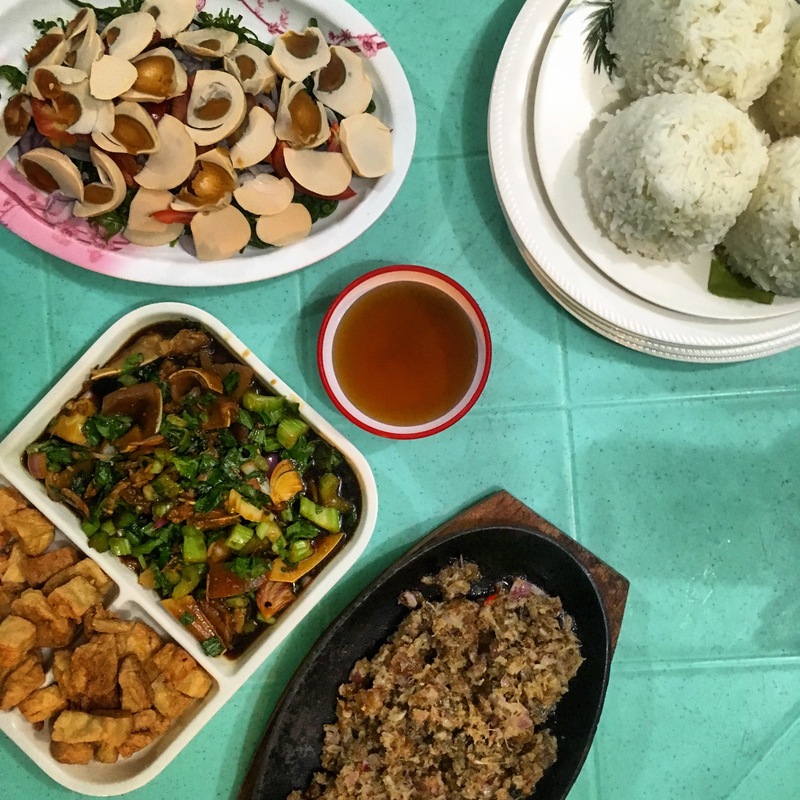 There’s a reason that tokwa’t baboy and sisig get equal billing on the restaurant’s name–they’re equally delicious. I can’t eat meat because it makes me queasy, but I was more than happy to brave a headache for the sisig, which was crunchy and chewy without the aid of egg or mayonnaise. The tokwa’t baboy was, for lack of a better word, amazing. It’s your usual hard tofu and pork (they used pig’s ears) in a soy and onion marinade, but the restaurant’s version has celery and kinchay, which adds a surprising amount of flavor and texture. It didn’t need the pork, honestly. We also enjoyed the pako (fiddlehead fern) salad, which was topped with a surprising amount of salted egg and came with a sweet vinaigrette. It’s hard to find pako in Manila, and the Pampangueños are fiercely proud of the fact that it can be found most anywhere in Pampanga. Am I jealous? Yes, I am. Vanessa was raving about her favorite streetside mami (noodle) stall, which served noodles with beef brains, so we tried some of that, too. I just had a sip off my Ian’s bowl. The noodles were nice and chewy, not overcooked. The broth was deep and rich and tasted like it had been simmering for a lot longer than the three hours tthe veendor said it took to cook it. The brains were soft and buttery. Brains aren’t my thing, but I can understand why this dish is such a big hit. The piping hot snack cost Php35 (US$.70) and is filling as well as delicious. No wonder it sells out so fast. It was also mentioned that we had to try the Razon’s halo-halo in Pampanga, where the chain is originally from, because the serving in Manila is but a shadow of the glory that can be found in Pampanga. And you know what? It’s true! A Razon’s halo-halo in Manila, though absolutely delicious, only comes witha smidge of ingredients–the rest is ice and milk. In San Fernando–we didn’t even try it in Guagua, where it’s from–the ingredients take up half the tumbler! At Php80, it’s a bit expensive by Pampanga standards, but still cheaper than in Manila (where it costs Php115), and more satisfying, to boot. Pampanga halo-halo is diifferent from regular halo-halo. Also known as ‘white halo-halo,’ it only has three ingredients, leche flan being the darkest in color, and doesn’t use beans. We got an extra plate of leche flan because you can never have enough leche flan with your halo-halo. At Php80 for five slices, Razon’s leche flan is expensive, even by Manila standards, but it was oh so worth it. Creamy with a hint of citrus, a reminder of how most places don’t make leche flan like this anymore. Ian and I also stopped by the San Ferando Wet Market, where we bought Pampanga-style tocino (cured pork) and longganisa (breakfast sausage) to take home. If you like your breakfast meat sweet, Pampanga-style is for you! Our last lunch was at Abe’s Farm at the foot of Mt. Arayat. You get the same fare as the Abe’s restaurants in Manila, but with a different view. The only thing missing were hammocks where we could nap after. There were more places that we wanted to try, but we didn’t have time or stomach space. It only means that we’ll have to find our way back someday. Thank you very much to Vanessa, Melissa, Malds, and your mom for being so nice to us! P.S. If you happen to be in The Orchid Gardens, check out the 7-Eleven outside. It has wood paneling, well-lit booths, and machuca tiles.